These simple, fudgy, sunflower seed butter-based bars have a secret ingredient: potato chips. 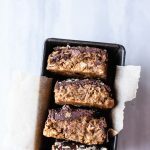 But that secret ingredient adds an addicting crunch to these Paleo No Bake “Peanut Butter” Bars! Line a square baking pan with parchment paper and set aside. In a large bowl, add the coconut oil, sunflower seed butter, and maple syrup, mixing until smooth. Mix in the coconut flour and crushed potato chips. Transfer the mixture to the lined baking pan, using a rubber spatula to evenly distribute and smooth throughout the pan. Melt chocolate chips by microwaving in 10 second increments or using a double boiler on the stovetop. Stir in coconut oil and sunflower seed butter until smooth and glossy. Spread melted chocolate over the potato chip mixture. Sprinkle with extra potato chip crumbles, if desired. Cover and refrigerate until ready to eat. Serve cold – these get melty quickly!